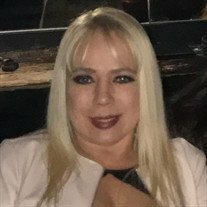 On Sunday, December 2nd 2018, Roslyn "Rosie" Arroyo, mother, grandmother, daughter and sister, tragically passed away at the age of 49 years young. Rosie will be forever remembered by her two sons, Robert "Mookie" Swaskee II and Julian Lowell Diaz; granddaughter, Aubrielle Arianna Diaz; and by her parents, Ivelisse and Pete Arroyo; as well as her brother and sisters, Angel, Melissa, Angela, Erica, and Evie. Rosie will also be forever remembered by her numerous nieces, nephews and extended family and dear friends. The family will receive friends on Saturday, December 8, from 10:00 am until the time of funeral services at 1:00 pm in the Dovin Funeral and Cremation Specialist, 2701 Elyria Avenue, Lorain. Rocky Ortiz, Deacon of Sacred Heart Chapel, Lorain, will officiate. Burial will follow in Calvary Cemetery. To send online condolences go to www.dovinfcs.com. Memorial donations in memory of Rosie may be made via Go fund me (Funeral Expenses for Rosie Arroyo) or at time of service.